Sanford and Hawley's Creative Kitchen Design Gallery has a variety of cabinet, vanity and counter tops for you to choose from. Our designers have over 50 years of experience creating designs to satisfy both style and function. Sanford and Hawley's Creative Kitchen Design Gallery has a variety of cabinet, vanity and counter tops for you to choose from. Our designers have over 50 years of experience creating designs to satisfy both style and function and our professional installation craftsmen will make sure that your ideas and dreams come to life. From the semi custom designs and style of Medallion Cabinetry to the budget conscious Wolfe Classic Cabinets, Sanford and Hawley has what you need to bring your dream kitchen to life. The flexibility of the many options and features available by Timberlake cabinets combined with a wide variety of Corian solid surface countertops, your ideas and budget can be designed into the kitchen that you have always wanted. Thinking about upgrading your kitchen on a tight budget? Ask our designers about Quartz or stone counter tops and new hardware selections. Don't forget to update that bathroom, we have number of vanities to choose from and what bathroom wouldn't be complete without a marble top? Synmar has over 70 colors and styles to chose from! WOLF Classic cabinets proudly offers eight popular door style/finish combinations at extremely attractive price points, including no up charges for the upscale look of paints and glazes. With a broad selection of SKU's, accessories and moldings, WOLF Classic Cabinets will make your design as beautiful as it is affordable. Portfolio Select® Series is Timberlake’s top tier—with the style, quality and features found in expensive custom-built kitchen cabinets. Alternatively, the Timberlake Portfolio® Series is a finely-crafted homeowner favorite that boasts a broad range of style choices and upgrade options. Fresh and modern with a traditional feel, the "Rushmore®" Portfolio Select® Series collection is a spectacular style with a solid raised center panel in either a square or Roman arch. The streamlined design works well with a range of decorating styles for every taste. Rushmore doors are full overlay and available in all wood types: painted maple, maple, cherry, oak, hickory, and thermo foil. The triple beading around the solid wood center panel of the Portfolio Select® Series "Wyoming" style creates a cascade effect that is both sophisticated and beautiful. It is a traditional favorite with solid hardwood and a choice of square or Roman arch. All Wyoming doors are solid wood and standard overlay except white thermo foil. Available in all cherry, maple, oak and hickory finishes, as well as white thermo foil in either Roman arch or square. The Portfolio® Series Sonoma style is a sleek, contemporary interpretation of Shaker design with crisp edges and flat surfaces. These qualities make it a popular choice for those seeking a tasteful, straight-line design without excess decoration. All Sonoma doors are full overlay in a square Shaker style and available in maple and cherry finishes. The Portfolio® Series Scottsdale offers a lower-cost, yet attractive option. The triple-carved waterfall effect on the inside edge of the rails and stiles accentuates the raised center panel, producing a favorite for the traditionalist at heart. All Scottsdale doors are standard overlay in either the square or classic arch style and available in maple, cherry, and oak finishes. 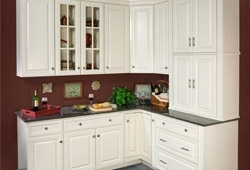 Medallion Cabinetry's solid wood construction is indicative of the pride taken in cabinetry construction with special interest in the details of the doors, drawer fronts, moldings and face frames. 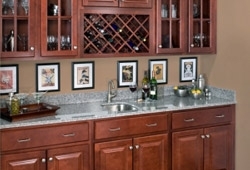 Medallion Cabinetry gives you custom options, quality wood and craftsmanship at a fraction of the cost of custom cabinetry. Solid wood door frame with french-cut miter assembly. Center panels are solid wood with beaded design. Slab doors and drawers are solid wood construction. 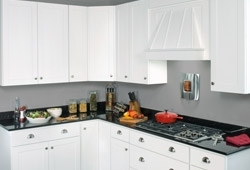 Slab doors and drawer fronts in certain sizes feature applied mitered molding. Rails and stiles are solid wood mortise and tenon construction. MAPLE, CHERRY and KNOTTY ALDER: Center panels are solid wood, reverse raised. QUARTERSAWN OAK: Center panels are veneered/recessed. Grain runs vertical on center panels of doors and drawer fronts. Door features square design with mortise and tenon solid wood frame and veneer flat center panel. Doors over 54" high receive a center horizontal rail. Drawer front is solid wood, slab construction. Five piece drawer front modification available. Door features square design with spline mitered solid wood frame and veneer flat center panel. All door heights receive a full height center panel (no center horizontal rail). 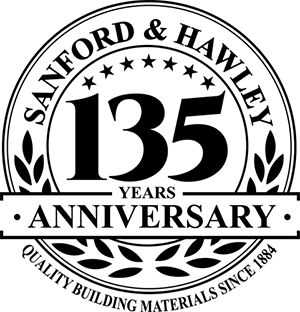 Kemper Brothers began making wardrobes in Richmond, IN in 1926, and in 1928, they added free standing kitchen cabinets to their product offering. By 1956, they were constructing built-in cabinets, and since that time, they have been a recognized name in quality kitchen cabinetry.